Central American migrants walk along the U.S. border fence looking for places to cross, in Tijuana, Mexico. 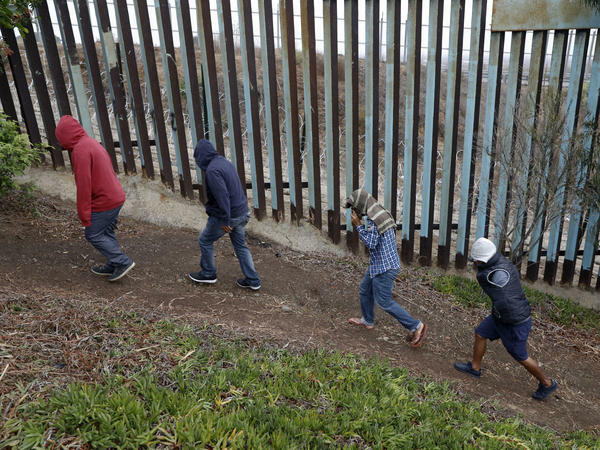 The girl and her father were part of a group of 163 people who surrendered to Border Patrol officers on the night of Dec. 6, south of Lordsburg, N.M., according to The Washington Post, which first reported the story. She was identified on Friday as Jakelin Caal Maquin, in a statement by U.S. Customs and Border Protection Commissioner Kevin K. McAleenan. "No one should risk injury, or even death, by crossing our border unlawfully," said McAleenan. "This is why I asked Congress on Tuesday to change our laws so that the United States is not incentivizing families to take this dangerous path." The CBP statement explained why the girl's death was not made public until after the Post report. "Out of respect to the family of the deceased, CBP did not issue a statement regarding the child's death at the time of the death. CBP is currently reviewing its public disclosure and notification policy related to deaths in our custody," the statement said. White House spokesman Hogan Gidley called it "a horrific, tragic situation." But he said the Trump administration was not responsible for the girl's death: "Does the administration take responsibility for a parent taking a child on a trek through Mexico to get to this country? No." In an earlier statement sent to NPR, a spokesperson from the Department of Homeland Security, which includes the Border Patrol, stated, "As we have always said, traveling north illegally is extremely dangerous." The representative added, "Unfortunately, despite our best efforts and the best efforts of the medical team treating the child, we were unable to stop this tragedy from occurring." Eight hours after the girl and her father were taken into custody, she began having seizures and her body temperature was measured at 105.7 degrees by emergency medical technicians. The girl "had not eaten or had any water for several days," Post reporter Nick Miroff told NPR's Morning Edition on Friday. In a background briefing for reporters, a DHS official said that "without the life-saving measures by CBP, this child would have likely died in the desert alone." A CBP official said during the briefing that during an initial screening at a Border Patrol station in Antelope Wells, N.M., the girl showed no symptoms, and her father signed an English language form saying she had no current health issues. The girl and her father were among a group of migrants who were then bused to a larger CBP facility in Lordsburg. It was during the bus ride that the girl began vomiting, the CBP official said. When the bus arrived at Lordsburg an hour and a half later, the official said, she was not breathing and was resuscitated by Border Patrol agents. She was said to have been flown by helicopter to a hospital in El Paso, Texas. The girl was revived after going into cardiac arrest but died less than 24 hours after being transported to the facility. "On behalf of the Department of Homeland Security, our sincerest condolences go out to the family of the child," the Homeland Security spokesperson said in the statement. "Border Patrol agents took every possible step to save the child's life under the most trying of circumstances. As fathers and mothers, brothers and sisters, we empathize with the loss of any child." The girl's father has not been publicly identified; Miroff says he is in El Paso, where a charity group is providing support. The CBP will investigate the case to determine whether the agency followed all correct procedures and policies, and the Inspector General of DHS will also conduct an investigation. Reacting to the girl's death, Democratic Rep. Joaquin Castro of Texas told NPR, "I think it's true that 163 people, for a small Border Patrol station, is a lot of people to deal with. But you would also think that you can identify someone who's on the verge of death." The investigations should answer the question of whether the girl asked for food, water or help — and whether any was given, Castro said. The incident comes as U.S. officials say they are holding almost 15,000 immigrant children in nearly full detention facilities. At the same time, border agents are apprehending more families with children than ever. Castro says he blames President Trump's immigration policies for putting desperate people at risk, saying, "By limiting the ability of folks to present themselves at the port of entry, the Trump administration is making it more dangerous for these folks." In November, 25,172 "family units" were apprehended at the southern border, according to a CBP report, an increase of more than 2,000 families since October. Last year, 7,016 families were apprehended in November. "The small Border Patrol station in Lordsburg received a single group of 227 migrants on Thursday, according to CBP, after taking in separate group of 123 on Wednesday. Both groups — extremely large by CBP standards — mostly consisted of families and children, according to the agency. "The agency said it was expecting an autopsy on the child, but results would not likely be available for several weeks. An initial diagnosis by physicians at El Paso's Providence Hospital listed the cause of death as septic shock, fever and dehydration."